Liverpool have agreed a deal to sign Bayer Leverkusen's highly-rated 20-year-old midfielder Emre Can. Can made 29 Bundesliga appearances for Bayer last season, scoring three goals, as his side finished fourth in the table. The transfer is expected to be confirmed on 1st July although Bayer have already wished the youngster well on Merseyside. Reds boss Brendan Rodgers, after guiding his side to second in the Premier League table last season, has now signed two new players this summer, with Southampton's England striker Rickie Lambert being his first capture. Emre Can developed very well and very quickly at Leverkusen over the last 12 months. Can is a Germany-Under-21 international who had a buyout clause of £9.75million in his Bayer contract. Bayern Munich, who sold Can to Leverkusen last summer for £4.4million, had the first option to buy him back, but they have been handed £1.2million compensation to waive that option. 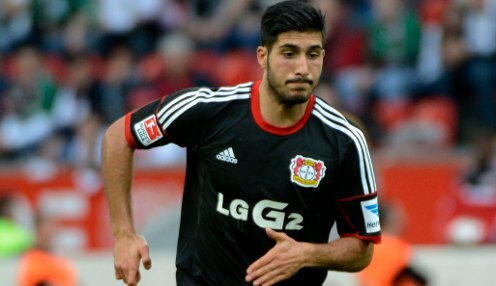 Bayer's CEO Michael Schade said: "Emre Can developed very well and very quickly at Leverkusen over the last 12 months. "We would like to have kept him here but the release clause was a part of his contract. Therefore we wish him every success for his development in the Premier League." Liverpool can be backed at 1/1 to win the Premier League title in the 2014-15 campaign and are 1/1 to finish in the top four. They are also available at 1/1 to win next season's Champions League.